RS Components has launched an IIoT development kit for the HARTING MICA edge computer. 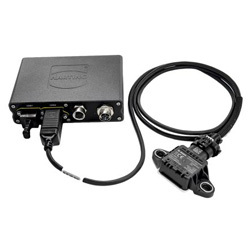 The Harting MICA CISS IIoT kit is a simple plug-and-play system that allows fast digital condition monitoring of many sensor inputs from machinery. This is claimed to be the first plug-and-play IIoT development kit to offer IP54 protection, making it ideal for long-term use in factory automation environments as well as for prototyping and evaluation. The IIoT kit integrates a Bosch CISS multiple sensor unit with a MICA edge computer. Firing up the software needs only a few simple steps, so sensor data is collected almost immediately. The compact, IP54-rated CISS sensor unit can be connected to any surface and can measure up to eight physical parameters: humidity; temperature; vibration; pressure; light; change of position; magnetic field; and acoustics. The robust, IP67-rated MICA computer can be placed right next to machinery, with no need for a control cabinet. MICA attaches to the sensor unit and local network using industry standard connectors. Sensor data is presented in MQTT format via the integrated browser-based Node-Red dashboard. Data can be analysed and saved in any IT system or IoT platform. A Microsoft Azure Cloud gateway is pre-installed and configured using NodeRed.